According to the US Energy Information Administration (which heretofore I never knew existed) when you burn a typical E10 gallon of gasoline in your car, it produces about 18.95 pounds of CO2. Really? A gallon of gasoline only weighs 6 pounds. Part of the answer is that a lot of Oxygen with an atomic mass of 16 is drawn in during combustion. Yet a direct energy conversion using EIA figures of 157 pounds CO2 per million BTU yields only 18 pounds CO2 per gallon of ordinary (not 10% ethanol) gasoline which according to their figures produces 19.6 pounds CO2 when burned. We argue that this ~1.5 pound penalty represents CO2 produced in distribution of gasoline. A Tesla will go about 90 miles on the equivalent amount of electrical energy to a gallon of gasoline. To assess the CO2 produced when the energy to create the 33.7 kWh of electricity that equals the gallon of gasoline, it is necessary to know where the electricity came from. If that electricity came from solar panels on the house where the Tesla lives, it is a beautiful situation. That Tesla is driving on sunshine. Unfortunately, most Teslas do not live in houses with enough solar panels to feed them and their electricity comes from the grid. We want to be scrupulously fair, and whatever the “unspecified sources of power” may be, we will grant them to the renewable sources and just make it easy by saying 52% of California’s power comes from fossil fuels. We are saying that over half of the energy that drives Teslas from the grid comes from fossil fuels. 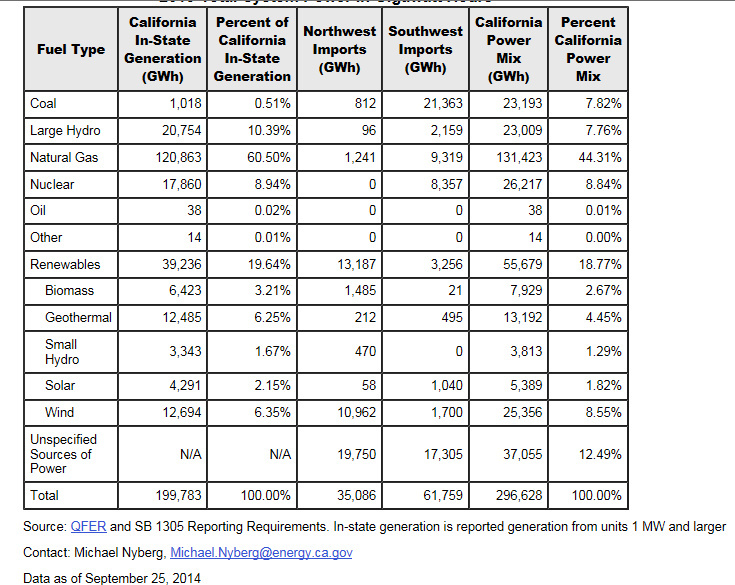 To create a weighted average Carbon footprint from the California grid we need to know the Co2 production from the 7.82% coal (purchased out of state of course) and the 44.31% natural gas. According to the US Energy Information Administration burning anthracite coal produces 229 pounds of CO2 per million BTU, lignite 215, and bituminous (the highest grade) 206. Natural gas (mostly methane) is 117 pounds CO2 per million BTU. In a further abundance of generosity we will say the out of state coal burned is all lignite. We get our weighted average CO2/ million BTU by multiplying .0782 x 206 + .4431 x 117=68 pounds of CO2 per million BTU from the California grid. We now need to know the kWh equivalent of a million BTU. We know that a gallon of gas=115000BTU=33.7kWh. Dividing 115000 by 33.7 gives us 3412 BTU/kWh as a raw energy conversion. We know that a million BTU produces 68 pounds of CO2 so we cross multiply 3412 x 68=232016/1m=.23 pounds CO2 per kWh. Multiply by 33.7 yields 7.75 pounds of CO2 for the equivalent electricity to a gallon of gas that produces 18.95 pounds of CO2 when burned. Sounds good, doesn’t it. Ah, we forget conversion efficiency. When you burn gasoline directly the pistons go back and forth and the wheels turn and this is built into miles per gallon. Not so electricity. First you must convert it from fossil fuel and all conversion comes with a penalty. The conversion efficiency of natural gas is about 41% and coal 33%. Other sources have similar conversion losses. We are just going to say that the efficiency is 40% across the grid. We must therefore divide the electric 7.75 pounds by .4 to yield 19.4 pounds. This somewhat more the 18.95 of a gallon of gas. There is another problem. Line loss through the grid is about 30%. We will therefore say transmission efficiency is 70% and we must further divide the 19.4 pounds by .7 to yield 27.7 pounds of CO2 for the electric equivalent of a gallon of gas that produces 18.95, 32% more for the electricity. What winds up saving the Tesla is the 90 miles it gets out of this. A typical gas/electric hybrid vehicle gets 50 miles per gallon. To make it really simple, we can say that while the electricity it uses produces 32% more CO2, the Tesla gets 44% better mileage. The Tesla does have a smaller Carbon footprint than a hybrid, but not by very much. You will find this el. Nissan Leaf vs. Honda Civic analysis interesting. A $/mile favors the Civic at present gas prices.